To keep it short: tennis elbow is caused by chronic damage to the common extensor tendon, which is then failing to heal properly from overuse. 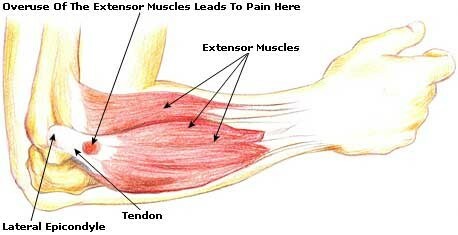 The tendon attaches at the lateral epicondyle. You can see what this looks like below. Jobs and activities that involve repetitive wrist and hand movements can lead to wear and tear on the tendon, experienced as pain and weakness. Examples of those prone to this sort of damage include assembly line workers, cashiers, hairdressers, and plumbers, as well as players of racquet sports like tennis. This kind of injury doesn’t happen overnight. By the time you start feeling pain, the issue has been going on for a while. Be patient. This injury took time to develop, and it will take time to heal. However, that doesn’t mean that you can't get short term pain relief as you work towards recovery. I want to share with you a few tools that were the most helpful for me. If you're wrestling with tennis elbow or hope to prevent it from cropping up, these will be a great asset to you. Compared to muscles, tendons have a poor blood supply. This is why a tendon injury takes longer to heal; nutrients and healing factors can't access the site of the injury as efficiently. The compression from the sleeve is thought to increase blood flow and keep the area warm, as well as reduce stiffness, pain, and fatigue. I've found this incredibly helpful for short term pain relief. While an elbow sleeve doesn't fix the underlying issue, it does allow you to carry out your daily tasks with less pain and discomfort. It’s a good idea to wear this while doing your rehab exercises: I still wear them during warm ups. The FlexBar is a rehab tool designed specifically to deal with wrist, forearm, and elbow injuries. A study was done on people with tennis elbow. They were split into two groups: a traditional physical therapy treatment group, and a physical therapy plus the FlexBar group. After 7 weeks, the group using the FlexBar improved their pain score by 81% vs only 22% in the therapy only group. That's a 59% difference! The exercise used in the study is called the Tyler Twist. The protocol is 3 sets of 15 repetitions every day on the affected arm. Below is a link to how to do the exercise starting at 4:25. There are 4 levels of resistance based on the flexbar’s color, with yellow being the lightest and blue being the heaviest. Unfortunately, if you go with the name brand (TheraBand), each individual color will cost you around $18. Luckily, there’s a much cheaper generic version that combines 3-in-1, and it works just as well as the TheraBand bar used in the study. This is just a single bar with different levels of resistance, so you only have to buy one instead of 3 or 4 separate bars. If you go with the SIMIEN Flexible Rubber Twist Bar you save $32 compared to getting each of the separate Therabands. It also comes with 2 free eBooks which show you how to use the twist bar and give helpful advice for tennis elbow. If you've spent much time around fitness, you've probably heard about the importance of balancing opposing muscle groups. For example, knee injuries can often be traced back to weak, underactive glutes/hamstrings, and tight overactive quadriceps. Likewise, an imbalance between the muscles that squeeze the hand and the muscles that open it can lead to overuse injuries in the wrist, forearm, and elbow. Whether you're a rock climber or a computer programmer, most of us tend to over work our gripping muscles. The Hand X Band is a cheap and effective tool to correct this common muscle imbalance. It will go a long way towards recovery and injury prevention. It slips around your fingertips and allows you to strengthen the extensors that open the hand. It comes in 3 resistance levels: light, medium, or heavy. You can buy them individually for about $10 each, or you can buy the set of 3 to save a few bucks. I started with the light band because I didn't want to irritate my tendinitis. I could find no specific way to use the Hand X Band, so I copied the FlexBar protocol: perform 3x15 repetitions each day on both hands. On workout days where you'll be doing a lot gripping, the Hand X Band can be a great part of your warm up. This is a complex issue, as you’ve probably realized, and a lot of factors can play into it. Although these tools are extremely helpful, what made the biggest difference was working with a professional that understood the human body. This allowed me to address the muscular imbalances and improper movement patterns that caused my injury. If you're in pain, there is a reason. Don't settle for an anti-inflammatory from your doctor. Take action. Reach out to a professional that can help you.